Need more apps for your favorite device? iOSnoops can help! Here are 23 iPhone, iPad and iPod touch apps that have just gone free. 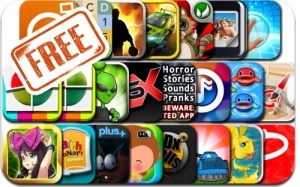 This apps gone free alert includes Pop Flux, Gold Crown Video Poker, Rush City, Trunky Fish Game, Bravo Force, Find the Difference, Doodle Defense, Car Club: Tuning Storm, Photo Slice, and many others.